In January to March, the seasonally adjusted volume of Finland’s gross domestic product increased by 1.2 per cent from the previous quarter. GDP adjusted for working days grew by 3.1 per cent compared to the first quarter of 2017. Calculated at current prices, gross domestic product adjusted for working days was 4.3 per cent higher than one year ago. According to preliminary data compiled by Eurostat, GDP in the EU 28 area grew by 0.4 per cent in the first quarter compared to the previous quarter. 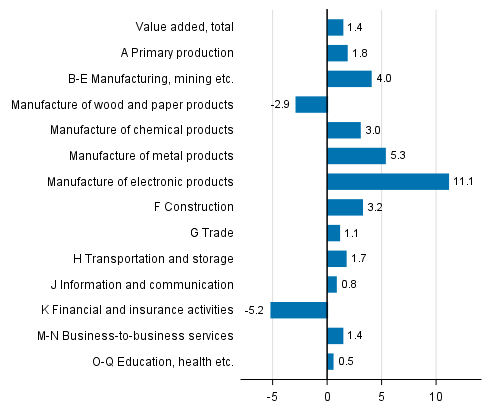 The volume of total value added generated by all industries increased by 1.4 per cent from the previous quarter and by 3.1 per cent from twelve months back. In primary production, that is, agriculture, forestry and fishing, the volume of value added grew in January to March by two per cent from the previous quarter and remained on level with the first quarter of 2017. The volume of value added in agriculture declined by two per cent but forestry grew by one per cent from last year. The growth rate accelerated in manufacturing industries in January to March: the value added in all manufacturing grew by four per cent from the previous quarter. Adjusted for working days, output in manufacturing was three per cent higher than one year before. The volume of output in the metal industry (excl. electrical and electronics industry) and the electrical and electronics industry, grew particularly much, being six per cent higher in the first quarter than one year before, as well as energy supply and water and waste management, growing by eight per cent from twelve months back. The development was more subdued in the forest industry, in which output contracted by one per cent from last year, and in the chemical industry, which increased by one per cent from the year before. The construction industry grew by three per cent in January to March from the previous quarter and by seven per cent from one year ago. In service industries, the volume increased by one per cent from the previous quarter and by two per cent year-on-year. Compared to one year ago, value added in private services grew by three per cent and in public services by one per cent. The volume of trade was one per cent up on the previous quarter and five per cent up on twelve months back. Nearly all other service industries also showed clear growth, and only financial and insurance activities contracted from the previous year. In addition, the industry of information and communication activities remained on level with the year before. Total demand increased in January to March by three per cent from the first quarter in 2017. 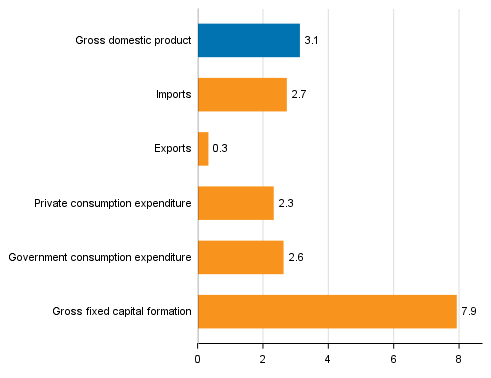 In particular, the growth in consumption and investments increased the demand in the national economy. In January to March, the volume of exports decreased by one per cent compared with the previous quarter and remained on level with one year back. Exports of goods contracted slightly but exports of services grew by two per cent from one year ago. The volume of imports contracted by nearly one per cent from the previous quarter but increased by three per cent year-on-year. Imports of goods grew by two per cent and those of services by four per cent year-on-year. In the first quarter, the volume of household consumption grew by one per cent from the previous quarter and by nearly three per cent from twelve months back. Public consumption expenditure grew by three per cent compared to the first quarter of 2017. Gross fixed capital formation, or investments, grew by four per cent from the previous quarter and by eight per cent year-on-year. Private investments grew by 10 per cent but public investments decreased by two per cent from one year back. Investments in residential buildings improved by 10 per cent and investments in non-residential buildings by seven per cent from one year ago. Investments in civil engineering grew by three per cent year-on-year. The volume of gross fixed capital formation in machinery, equipment and transport equipment increased by 16 per cent from the first quarter of 2017. In January to March, the number of employed persons increased by 0.7 per cent from the previous quarter and by 2.3 per cent year-on-year. The number of hours worked in the national economy grew by 1.0 per cent from the previous quarter and by 2.1 per cent from one year back. According to Statistics Finland’s Labour Force Survey, the rate of unemployment for the January to March period was 8.8 per cent, while in last year’s corresponding period it was 9.3 per cent. In the January to March period, the nominal wages and salaries bill of the national economy grew by 1.3 per cent from the previous quarter and by 4.3 per cent year-on-year. Social contributions paid by employers grew by 0.1 per cent from one year back. The operating surplus (net), which in business bookkeeping corresponds roughly with operating profit, grew by 8.9 per cent from twelve months back. Gross national income at current prices was 4.3 per cent higher than one year previously. 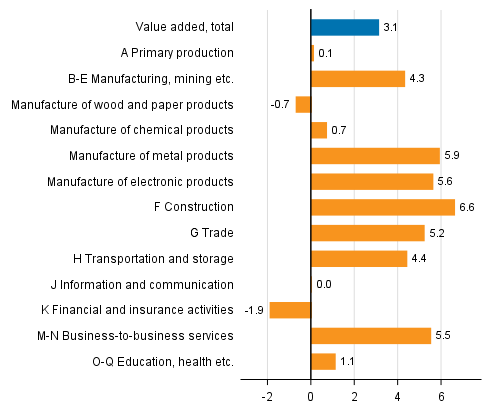 These preliminary quarterly data are based on the source information on economic development that had become available by 25 May 2018. The annual level data for 1990 to 2015 correspond with the National Accounts data released on 31 January 2018, except for those on the rest of the world sector (imports, exports, primary income from/to the rest of the world), which may have become revised. The National Accounts for 2016 and 2017 will be released on 12 July 2018. Then the time series of Quarterly National Accounts 1990Q1 to 2018Q1 will be benchmarked to the new time series of the National Accounts. The benchmarked data will be available in the database tables of the Quarterly National Accounts starting from the release date. National Accounts data concerning the second quarter of 2018 will be released on 31 August 2018, when data for previous quarters will also be revised. A flash estimate on GDP development for April to June will be released in connection with the June data of the the Trend Indicator of Output on 14 August 2018. 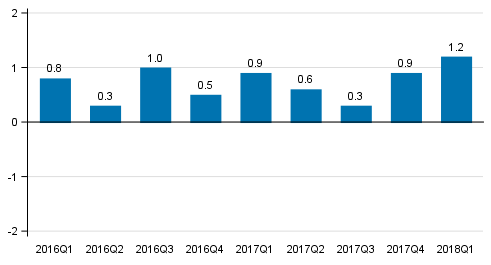 Due to the benchmarking and seasonal adjustment methods, quarterly data in the entire time series may become slightly revised in connection with each release. However, the largest revisions take place during the two to three years following the release on a quarter, because final annual accounts data are published at a lag of around two years from the end of the statistical reference year. Seasonally adjusted and trend time series always become revised against new observations irrespective of whether the original time series becomes revised or not. The quality description can be accessed at (in Finnish): http://www.tilastokeskus.fi/til/ntp/laa.html . Methodological description of Quarterly National Accounts. ISSN=1797-9765. 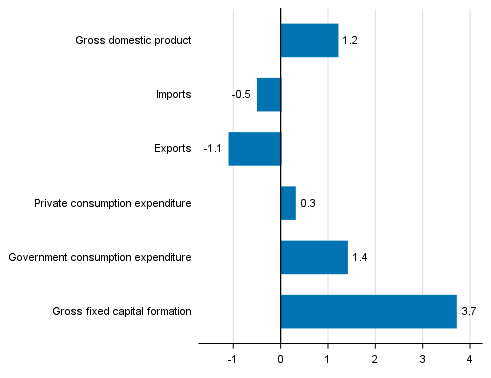 1st quarter 2018, Finland’s national economy continued growing in January to March . Helsinki: Statistics Finland [referred: 25.4.2019].